Finally the Supreme Court has published the collegium recommendations regarding the appointment of two Supreme Court Judges and High Court Chief Justices have been published in the Supreme Court website.All the recommendations were made on January-10, 2018. It include the names of Uttarakhand Chief Justice KM Joseph and Senior Advocate Indu Malhotra. Indu Malhotra, if appointed, will be the first woman lawyer directly appointed from the Bar. "The Collegium discussed names of Chief Justices and senior puisne High Court Judges eligible for appointment as Judges of the Supreme Court. The Collegium considers that at present Mr. Justice K.M. Joseph, who hails from Kerala High Court and is currently functioning as Chief Justice of Uttarakhand High Court, is more deserving and suitable in all respects than other Chief Justices and senior puisne Judges of High Courts for being appointed as Judges of the Supreme Court of India. While recommending the name of Mr. Justice K.M. Joseph, the Collegium has taken into consideration combined seniority on all-India basis of Chief Justices and senior puisne Judges of High Courts, apart from their merit and integrity. Mr. Justice K.M. Joseph was appointed as a Judge of the Kerala High Court on 14th October, 2004 and was elevated as Chief Justice of the Uttarakhand High Court on 31st July, 2014 and since then has been functioning there. He stands at Sl. No.45 in the combined seniority of High Court Judges on all-India basis. We have also considered the names of eminent members of the Bar. In our considered opinion, at present, Ms. Indu Malhotra, Senior Advocate, is eminently suitable for being appointed as a Judge in the Supreme Court. We, therefore, recommend that Mr. Justice K.M. 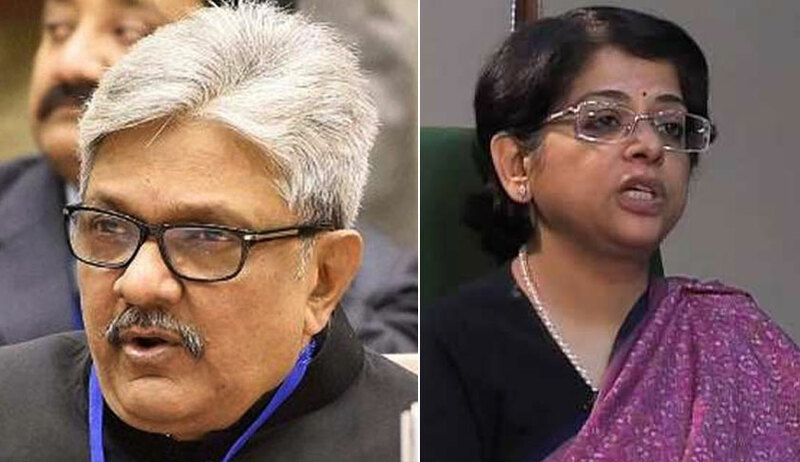 Joseph, Chief Justice, Uttarakhand High Court and Ms. Indu Malhotra, Senior Advocate, be appointed as Judges in the Supreme Court of India"
Mr. Justice Aniruddha Bose is a senior puisne Judge of Calcutta High Court. Having regard to all relevant factors, the Collegium finds Mr. Justice Aniruddha Bose suitable in all respects for being appointed as Chief Justice of the Delhi High Court. Mr. Justice Tarun Agrawala is the senior-most Judge from Allahabad High Court and is serving in that High Court since his elevation on 7th January, 2004. Having regard to all relevant factors, the Collegium finds Mr. Justice Tarun Agrawala suitable in all respects for being appointed as Chief Justice of the Meghalaya High Court.The Collegium resolves to recommend accordingly. While making the above recommendation, the Collegium has also taken into consideration the fact that there is only one Chief Justice from Allahabad High Court, which is the largest High Court of the country. Mr. Justice Jyotirmay Bhattacharya is the senior-most Judge from Calcutta High Court and at present is functioning as Acting Chief Justice in that High Court. Having regard to all relevant factors, the Collegium is of the view that Mr. Justice Jyotirmay Bhattacharya is suitable in all respects for being appointed as Chief Justice of that High Court. The Collegium resolves to recommend accordingly. Mrs. Justice Abhilasha Kumari is the senior-most Judge from Himachal Pradesh High Court and is at present functioning on transfer in the Gujarat High Court. Having regard to all relevant factors, the Collegium finds Mrs. Justice Abhilasha Kumari suitable in all respects for being appointed as Chief Justice of the Manipur High Court. The Collegium resolves to recommend accordingly. While making the above recommendation, the Collegium has also taken into consideration the fact that at present there is no Chief Justice from Himachal Pradesh High Court and that the turn of Mrs. Justice Abhilasha Kumari to be considered for appointment has arrived on 17th February, 2017 when Mr. Justice Deepak Gupta (PHC: Himachal Pradesh) was elevated to the Supreme Court. Mr. Justice Antony Dominic is the senior-most Judge from Kerala High Court and at present is functioning as Acting Chief Justice of that High Court. Having regard to all relevant factors, the Collegium is of the view that Mr. Justice Antony Dominic is suitable in all respects for being appointed as Chief Justice of that High Court.The Collegium resolves to recommend accordingly. Mr. Justice Ajay Kumar Tripathi is the senior-most Judge from Patna High Court and is serving in that High Court since his elevation on 9th October, 2006. Having regard to all relevant factors, the Collegium finds Mr. Justice Ajay Kumar Tripathi suitable in all respects for being appointed as Chief Justice of the Chhattisgarh High Court. The Collegium resolves to recommend accordingly. Appointment of Chief Justice in Himachal Pradesh High Court. Mr. Justice Surya Kant is the senior puisne Judge from Punjab & Haryana High Court and is serving in that High Court since his elevation on 9th January, 2004. Having regard to all relevant factors, the Collegium finds Mr. Justice Surya Kant suitable in all respects for being appointed as Chief Justice of the Himachal Pradesh High Court. The Collegium resolves to recommend accordingly. It is deemed necessary to add here that while making the above recommendation, we have also considered the name of Mr. Justice A.K. Mittal, who hails from the same High Court as does Mr. Justice Surya Kant. Though Mr. Justice A.K. Mittal is senior to Mr. Justice Surya Kant in the seniority of Judges of the Punjab & Haryana High Court, having regard to all relevant factors and since we consider Mr. Justice Surya Kant more suitable than Mr. Justice A.K. Mittal, we are not recommending name of the latter, for the present, for appointment as Chief Justice. Appointment of Chief Justice in Telangana & Andhra Pradesh High Court. The Collegium resolves to recommend that Mr. Justice Dinesh Maheshwari, Chief Justice, Meghalaya High Court, be transferred, in the interest of better administration of justice, to Karnataka High Court. The Collegium resolves to recommend that Mr. Justice Hrishikesh Roy, Judge, Gauhati High Court, be transferred, in the interest of better administration of justice, to Kerala High Court.